James. Wow. I am so glad you posted this. It’s a conversation I might not have seen except maybe several degrees and many months removed. I feel as though the “eversion” Steve Jones is talking about is really visible in this doxxing (which sounds terrifying). I look forward to hearing more of your findings! What you have exposed here is a commodification of social data. The interesting pivot point here is that your look into #gamergate is reliant upon a data set that has been given value by the advertising and data analysis industry. Although you may be looking to build an archive for the purpose of archiving for later research and analysis, the truth of the matter is this data is a resource for those who want to sell this particular community a product or type of content. It is striking to think about the amount, complexity, and nature of data sets sitting on servers at Data Management Platforms. One particular company has the ability to curate editorial content to the specific user based off of a complex system of tags and personalized profiles. Tracking pixels follow users around the web taking information like topic preference, time spent, device, location, time of day, etc. This builds out a complex user profile that takes into account that persons habits. Those profiles are then sold to major advertising brands, publications, or ad agencies for a ridiculous profit on the grounds that the advertising they put in front of those users is hyper-targeted and personalized. While it is borderline scary how detailed these profiles are, there is great academic value in the mapped behaviors and habits of this sort. The problem is, access to this data requires deep pockets. This brings forward a deeper appreciation for things like open source data. While one person may not be able to create this archive in it’s totality, that person initiating the task can see the project through to it’s completion at the hands of willing contributors. Analysis and organization of that data could take the project even further. I will say, what you’ve done here is awesome. I enjoyed it thoroughly. This is really great work, and I definitely think it is worth archiving. I’ve been casually keeping tabs on the whole gamergate chaos, and find it really telling how many of the perpetrators feel it necessary to flood articles about gamergate with the same generic comments about how it isn’t a feminist/misogyny issue, and how it’s all about “ethics” (vague and never delved into) and proper journalism. The “gamer” community (gamer in quotations because I, too, feel like the title is dying) is definitely a microcosm of our larger society, but things like gamergate only prove that if any community needs reflection on its misogyny (and racism, homophobia, etc etc) I would definitely think that one. I’ve been following this as someone who has a morbid fascination in internet trainwrecks. This one’s a doozy. I’d be careful about drawing conclusions about anyone based on the frequency of words. There’s also context. Simply finding a word like “harass” doesn’t say anything about whether it’s for or against. Sarcasm will also mess up results. You can’t really draw any conclusions without actually reading the tweets, and until someone codes an AI capable of interpreting all the nuances in language, this will be true. I’ve seen a lot more toxicity from the anti-gamergate people than from gamergate itself. You should check out the gamergate hashtag on twitter if you don’t believe me. Heavy use of words like “SJW” come from the lack of any other concise label for the opposition. Meanwhile, those trolling the hashtag use labels like “neckbeard” and “manchild”, despite the existence of “gamergate” or even GG for when the character limit is an issue. Anti-GG extremists have also attacked NotYourShield users, claiming they’re white males, even after they’ve posted photos showing otherwise. That goes very much against the actual principles of social justice, which is why I refuse to acknowledge them as SJWs. It’s inaccurate. People on both sides have been harassed, threatened, and doxxed by extremists on the other side, and that’s never a good thing. Relevantly (to this post), our HotChirp sites archives trending tweets for thousands of topics. Great post! I would urge you not to spend too much money, but Godspeed! 1) The credibility of a group that is capable of wide-reaching harassment, and the credibility of another group that gets facts – Beyonce’s birthday! – wrong. Her birthday is actually September 4th, with the album “4” representing both her and Jay Z’s (“December 4th a star was born”) birthdays. BUT I digress…. 2) How such conversations change as a result of typos or the purposeful inclusion / exclusion of participants? I believe it was 4chan users that coined the popular typos “pwned” & “ZOMG”. Such instances are the result of the standard layout of a keyboard (P near O and shift near Z) yet such accepted typos weren’t the norm when communication was typewriters. The speed of the internet allows for such change, but also an underlying sense of mockery. “You just got pwned.” Etc etc. With that in mind, have you considered looking at how #gamergate has evolved? How overlapping hashtags may represent a new conversation? Typos of #gamergate that may have added to the conversation, tho silently? 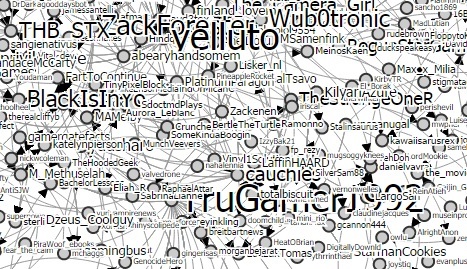 Could a new iteration of #gamergate take over? In the new ps article she talks about the evolution of language over a century, and at the end gives a story about a lost language that is decoded and transcribed by an American anthropologist. I see overlaps in many ways here with your piece: the tracking, decoding, and appropriation of a conversation. Maybe we can also be called digital anthropologists? Ps: I recommend not replying to posts on a iPad within WordPress itself. Toggling between the Margaret Atwood article and the post I lost my reply, and had to rewrite. OOPS. Learn from my technological mistake. It looks like you were on to something here. And editor at Medium mapped over 300,0000 tweets and made a beautiful visualization of his findings. He also takes the time to explain how he got the data, how it interacts, and what he thinks it means. It’s a top pick on DIGG today.